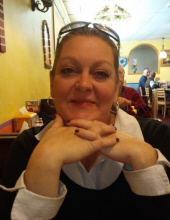 Her Legacy… Bethany Ann Birk, 55, passed away April 1, 2019. She was born on February 17, 1964, in Ann Arbor, Michigan to Albert H. Birk Jr. and Carol A. (Valind) Birk. She will be remembered as a strong, independent woman who was considered at times to be a bit feisty. Beth had many hobbies that she enjoyed doing like cooking, fishing, swimming at the lake where she grew up at, bartending, and being on social media. She was kind-hearted and very active in her union at Ford Motor Company at Local 898 and being involved with the adopt a child program. Her biggest love was spending time with her family, especially with her nephews and her grandchildren. She loved being a grandma most of all. She will be missed by all who knew her. Her Family… Beth will be missed by her children, Brandon (Katie)Birk and Nichole Birk; siblings, Kevin (Sherry) Birk, Deborah (Thomas) Loukotka, and Christopher Birk; grandchildren, Ezra Albert, and Violet Isabella; and her nephews that she adored, Joshua (Danielle), Justin, Jordon, Jacob, and Wyatt. She is preceded in death by her parents, Albert and Carol Birk. Her Farewell… Beth’s family and friends will gather on Wednesday, April 3, 2019 from 2:00-8:00pm, with a 6:00pm rosary, and a 7:30pm memory service at Borek Jennings Funeral Home, Hamburg Chapel. Her Community Farewell will be held on Thursday, April 4, 2019 at 11:00am (10:00am gathering) Mass of Christian Burial at St. Mary’s Catholic Church, Pinckney. Father Dan Kogut will serve as celebrant. Memorial contributions may be given to family for future designation. Please leave a message of comfort for Beth’s family at 1-877-231-7900, or sign her guestbook at www.borekjennings.com. To send flowers or a remembrance gift to the family of Bethany Ann Birk, please visit our Tribute Store. 10601 Dexter - Pinckney Rd. "Email Address" would like to share the life celebration of Bethany Ann Birk. Click on the "link" to go to share a favorite memory or leave a condolence message for the family.